When you are writing Entity Framework Core (EF Core) queries (i.e. reading data from the database) you want them to be quick to run (high performance) and quick to write. It turns out that it’s possible to do that in EF, but the “quick to run” part isn’t that obvious. I make a living around writing EF Core code quickly, and that performs well (I wrote the book, “Entity Framework Core in Action”) and my approach is to use the LINQ Select method (quick to run) and the AutoMapper library (quick to write). This article is about both “quick to run” and “quick to write”, but majors on AutoMapper, as the Select method is easy to understand, but AutoMapper does take a bit of getting used to. I also mention my EfCore.GenericServices library that uses AutoMapper, which speeds up the writing of database accesses even more. LINQ Select method normally produces the fastest performing query because they only load what you need, and some calculations can be run in the database (see Posts.Count later) . Writing Select queries contains more lines of code than other query approaches because you have to select each property you want to load. AutoMapper’s ProjectTo method can build the Select query for you, but you need to configure the mapping. Setting up the AutoMapper configuration isn’t total obvious (to me at least) so I give you some examples. My GenericServices library uses AutoMapper and does some of that configuring for you. This article is aimed at developers who use Microsoft’s Entity Framework library, so I assume you are familiar with C# code and either Entity Framework 6 (EF6.x) or Entity Framework Core library. I don’t assume you know the AutoMapper library, but I don’t detail all the features of AutoMapper and give links to its documentation. The examples in this article use EF Core, but all of the ideas are transferable to EF6.x. Database accesses are normally referred to as CRUD operation (Create, Read, Update and Delete), with the read referred to in EF as a query. Queries are normally the most common operation, and often the one you want to be quick (Google and Amazon searches have conditioned us to expect very fast searches). Sometimes the query is a list of things, like products you can buy or trains you could catch, and sometimes you need a single item, like a calendar event you want to change. When the data is stored in a relational database, like SQL Server, a query might need data from multiple parts of the database, called tables, to form the exact data the user wants to see. The EF Core library makes it easy to access a database by mapping the database tables to .NET classes (known as entity classes), and uses the database pointers (known as foreign keys) between tables to create references (known as navigational properties) to other entity classes. It also turns your LINQ commands into the correct language/format used by the database you want to access. The figure below shows four entity classes, which represent a set of Posts, each with a Blogger who wrote it, and some Tags (via a many-to-many PostTag linking entity class). The relational properties are represented in red. In general, the LINQ Select operator in Entity Framework Core (EF Core) can produce database queries that are often perform better than any other approach. This is because the Select method allows you to pick exactly the properties you want, including looking into related classes. This performance gain is especially good when part of the query can be done inside the database, e.g. like counting how many posts a blogger has written (I show that later). The problem is that writing a Select query, with an assignment for each property, is very repetitious and a bit boring (and boring is bad, as I can make mistakes when I am bored). In this article I show how you can use a library called AutoMapper to automatically build Select queries, which saves you time (and you don’t need to be bored anymore). I also cover one of my libraries that uses AutoMapper to make Create, Read, Update and Delete (known as CRUD) database accesses easier. In the next section I am going to build some queries to show this database in different ways. The first display I want to build a list of each blogger, with the number of posts they have written. Here is the type of display I want to show. This must pick out information from two of entity classes. Now, let’s see the different ways of obtaining that data. One way to do that would be to use Eager Loading. The code would look like this. That gets the data we need, but it pulls in ALL of the post’s content, when I only want to count them. That is very inefficient, because the Posts can be very big. If you need good performance then you don’t want to write your queries this way. NOTE: You get EVEN WORSE performance if you load the Posts via Lazy Loading, e.g. having a virtual public ICollection<Post> of Posts. That will cause one extra trip to the database for every entry. I get paid to performance tune EF systems and the first thing I look for is Lazy Loading – it’s a major performance drag. See the Summary of the performance table for detailed timings. And here is a hand-coded Select query that will only read in the data I actually need. This is more efficient as it only loads the data it needs. This is especially true for the count of the Blogger’s Posts – this is done in the database, which stops us loading all the Posts just to count them. The SQL that EF Core would create from this query looks like this (don’t worry if you don’t know SQL – take it from me that is very efficient). 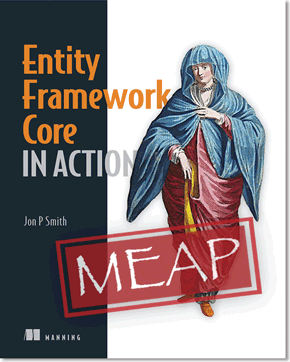 In section 12.5.1 on my book “Entity Framework Core in Action” I built a query to load the data to create the book display list (see http://efcoreinaction.com/ for live example site) using three approaches. Here is the result of the three different ways of loading the data. As you can see the Select query was the fastest. NOTE: I didn’t test Lazy loading as EF Core 2.1 wasn’t released when I was writing that chapter, but I can tell you it would be equal (or maybe worse) to the explicit loading timing. Having looked at the “quick to run” part lets move onto the “quick to write” part. The query examples so far are pretty easy to write, but in bigger Select queries you would have to write many assignments, and that gets tedious. This is where AutoMapper comes in, so lets now recreate the same query using AutoMapper. Then use that AutoMapper configuration in your query. I need to create my DTO, which is the same as the hand-coded one. The first two properties have the same name and type as properties in the Blogger class, so they are copied. The interesting property is the PostsCount – this is translated as Posts.Count(). That’s a AutoMapper feature which is helpful. NOTE: AutoMapper can also ‘flatten’ relationships’: what that means it can pick out a one-to-one relationship by joining together the two names without the dot in the middle. You will see this in part 2, where I list each Post, but access the Blogger’s Name by using the name of the relationship, Blogger, followed by the property’s name, Name, i.e. BloggerName. There are lots of ways to configure AutoMapper mappings. For NET Core the recommends using AutoMapper’s Profile and assembly scanning with NET Core’s Dependency Injection (DI). For this example, I use a DI approach to configuring your AutoMapper mapping in an ASP.NET Core web application. First you add a class that inherits AutoMapper’s Profile class, most likely near to where you define your DTOs. In class’s constructor you add one or more CreateMap methods to set up the mapping. Here is a simple example. Then you need to call AutoMapper’s AddAutoMapper() method. In ASP.NET Core that would be in the ConfigureServices method in the Startup class, e.g. The AddAutoMapper() method scans all the assemblies looking for all the classes that inherit AutoMapper.Profile class. It then produces a IMapper instance containing the all the Mappings found. NOTE: I find the configuring AutoMapper is the hard part, as it relies on me remembering to set up the AutoMapper mapping. I have tried a number of ways to make this better and I think in my EfCore.GenericServices I have got it right. In that I write my DTO and then you need to add an empty interface called ILinkToEntity<TEntity>, where TEntity is your class that EF Core maps to the database. Then the setup of EfCore.GenericServices a) finds the DTOs and then uses the TEntity part of the ILinkToEntity<TEntity> interface to, among other things, form the correct AutoMapper mappings. I’m now going to show you a ASP.NET Core controller so that you can see how the DI works, but you can use AutoMapper in any application you like. I have injected by EF Core content and the AutoMapper’s IMapper instance into the controller via the constructor. Then any of my methods in the ASP.NET Core controller. And the SQL code produced is the same as the hand-coded Select earlier in 1b. For this small DTO then it isn’t worth using AutoMapper, but most applications have hundreds of mappings like this, and classes that contains a lot more properties. This is where AutoMapper comes into its own. NOTE: If you are generally doing CRUD operations then you should look at my article “GenericServices: A library to provide CRUD front-end services from a EF Core database” that uses AutoMapper and EF Core to make CRUD very simple to do. AutoMapper is clever and can work out some relationships for you, but for more complex relationships you need to do some more configuring, which I cover in the next part. The next example is a summery list of all the articles, showing the bogger (author), the post title and the tags the post has. This is a bit more complex, especially around getting the tag names. Let’s start with the hand-coded LINQ Select query. First, I need to show you the DTO I use to hold the resulting query. Now the hand-coded Select query. Line 4: I can select the Name of the Blogger by using the navigational property. EF can handle any depth of selection, say the Bogger class had a property called Address, which has its own table holding address information, then I could access the Blogger’s Country via x.Blogger.Address.Country. EF produces efficient SQL (an INNER JOIN) to extract the data from the related tables. Line 7: I want a list of all the Tag Name’s associated with this post. I therefore need to use the PostTag linking table to access the Tag names. The produces fairly efficient (see note below) SQL query by only extracting the data you need. NOTE: Handling “many” relationships, i.e. ones that return multiple results like the TagNames, is an area where EF Core can have performance issues. If I left off the .ToList() on the TagNames then it would query the database for each ListPostsDt0 (this is known as the N+1 database queries issue). But in EF Core version 2.1, adding the .ToList() turns the load of all the TagNames into one final database query. This is OK, but can still have problems – see my article “Entity Framework Core performance tuning – a worked example” to see an even better way to handle comma separated strings. Now the AutoMapper configuration code. The ForMember method (lines 6 to 9) takes two parts: the first part defines the property in the DTO that you are mapping (TagNames, on line 7), and the second part (lines 8 to 9) tells AutoMapper how to generate the data to go into the TagNames property from the input class, which is the Post class. NOTE: AutoMapper automatically turns the BloggerName into Blogger.Name – this is the “flattening” I referred to earlier. This is a very useful feature and makes handling references to a single relationship really easy. Let’s see the list articles query using AutoMapper’s ProjectTo method. In case I’ll show you a unit test as you might need this in your system. I also show how to create the IMapper variable using a helper method I created, as that is useful too (and checks you created the Profile class correctly). Where my helper method CreateMapperConfig, looks like this. NOTE: Technical point about unit testing. ProjectTo<T> need MapperConfiguration when testing, while Map<T> needs IMapper. Have a look at my unit tests of AutoMapper here for a good example of how to write tests that include AutoMapper. This produces the same SQL as the hand-codes example. NOTE: In EfCore.GenericServices you can configure the AutoMapper mappings by adding a class which inherits from PerDtoConfig<TDto, TEntity>. When EfCore.GenericServices is scanning for DTOs it also looks for matching PerDtoConfig<TDto, TEntity> classes uses that data to alter the AutoMapper’s MapperConfiguration. Firstly, I showed you how to create high performance queries by using the LINQ Select method. The Select query isn’t obvious – in fact the EF Core documentation on loading relationships doesn’t even list it even though you can load relationships in a Select method. But the ASP.NET Core EF tutorial lists Select as an option, as I was asked to help develop that tutorial . If you want fast and effective queries then think about using the LINQ Select method. The problem with the Select method is it takes some work to write it, e.g. when Selects have lots of properties in them then they get long and repetitious (i.e. boring). I showed that AutoMapper can help by automatically build the Select query for you. While AutoMapper is a great tool, but it takes a bit of getting used to, especially around the configuration. But when you have lots of queries then it’s worth the effort. Along the way I talk about my EfCore.GenericServices library, which uses AutoMapper inside. This handles the configuration of AutoMapper for you, which makes it a bit easier. But on the other hand, you need to learn how to set up EfCore.GenericServices. I have written an introductory article, some documentation, and an example application in the repo that you can run locally (it uses an in-memory database, so it runs anywhere), so don’t be afraid to try it.